The GOLD PRICE rose 1.30 to $1,077.60 on Comex. SILVER, relatively weaker the last few days, rose 7.3 cents to $14.164, still mired under the 20 DMA ($14.17). Somebody has to explain the silver and GOLD PRICE laziness here. The price of gold can’t get over its 20 DMA ($1,070.52) or its $1,080 resistance. Silver has just gone plumb to sleep. Odd, this behavior. Odder still with today’s big US dollar index tumble. Silver and gold price charts still look fine, indicators all point up, both have traced out V-bottoms, both have begun climbing. Only remains to ask, Why are they stalled? Durn! Y’all didn’t expect me to know, did you? I’m no more’n a nat’ral born durn fool from Tennessee. I can ask a milyun questions, but can’t answer a danged one. Course, sometimes asking the RIGHT question might be better than spoutin’ a bunch of no-good answers. Bottom line is markets are worried, worried today, but that worry isn’t slopping over into demand for silver and gold prices — yet. Today the US dollar index for little apparent cause fell 113 basis points (1.15%) a huge loss. That leaves the Great Drop on 3 December looking more and more like a permanently broken rally. 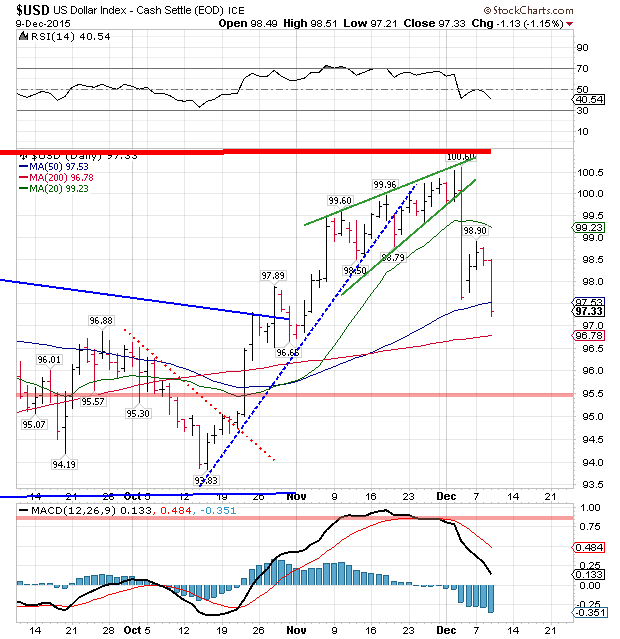 Dollar’s plunge today left it below the 50 DMA (97.53) and within easy striking distance of the 200 DMA (96.78). Some ECB apparatchik said something about the dollar’s fall on 3 December arising from too high expectations about what the ECB would announce. That must have set speculators to scratching their heads about what the Fed might do, and a flood of ’em decided skedaddling was the better part of valor. This chart shows their tracks. Santa Claus rally notwithstanding, stocks can’t get up and fly. Dow sank 15.67 (0.77%) to 17,492.30. S&P500, however, fell much more, 13.53 or 1.17% to 2,047.62. Dow in Gold and Dow in Silver turned down again, too.